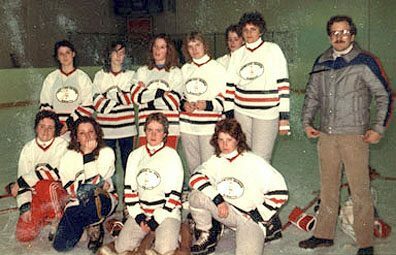 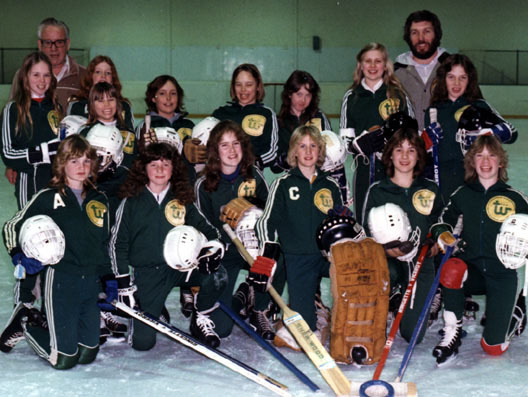 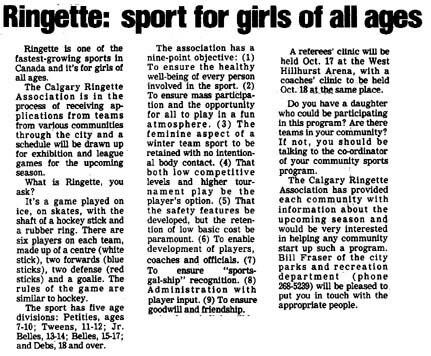 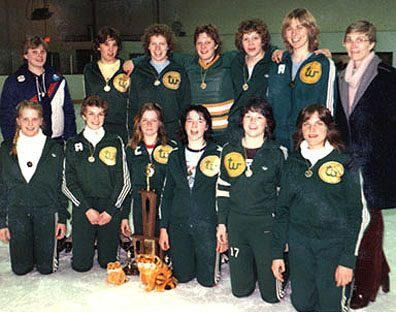 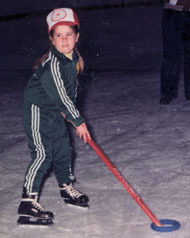 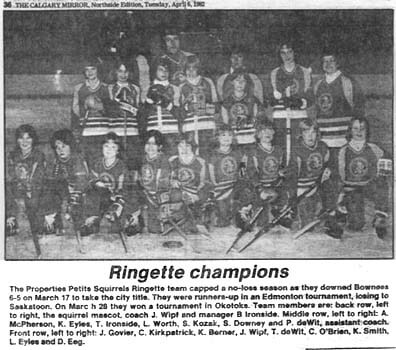 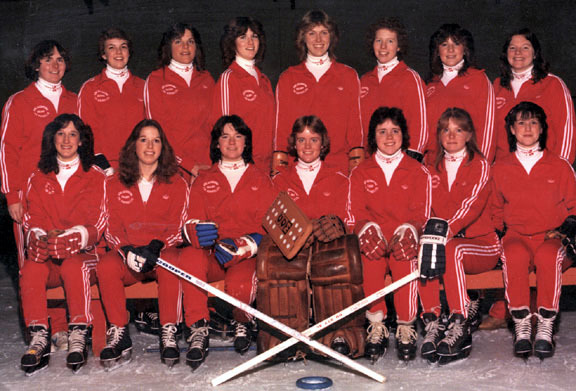 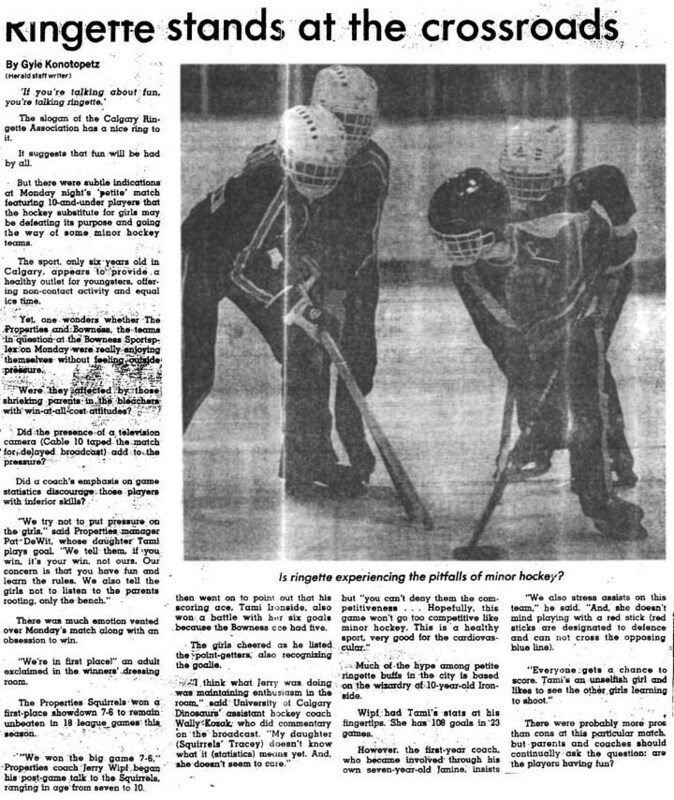 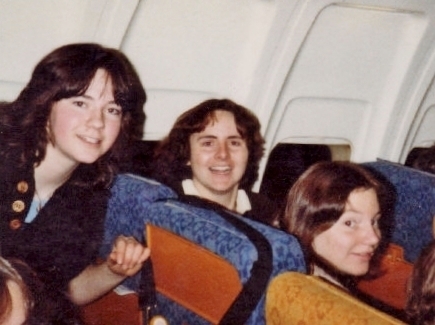 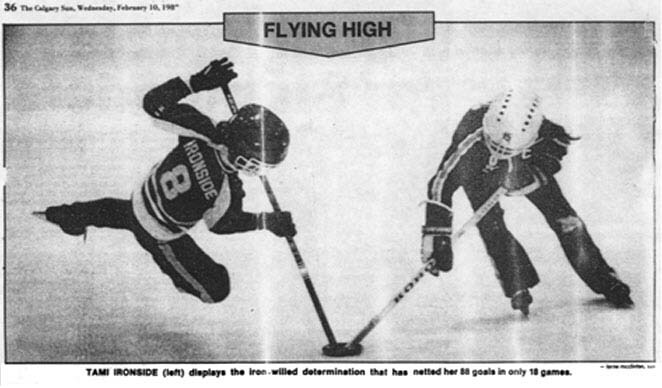 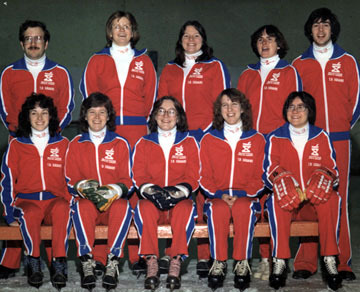 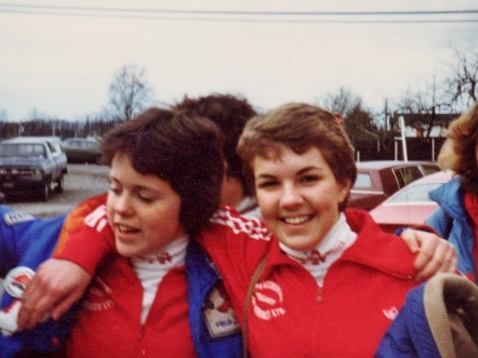 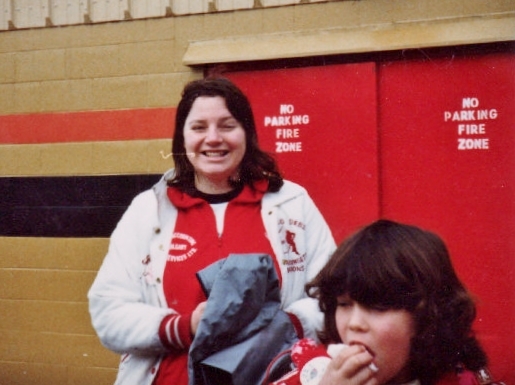 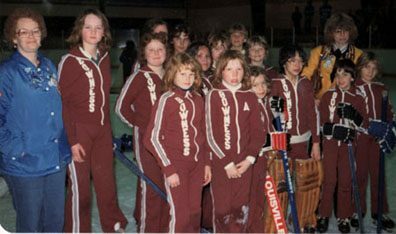 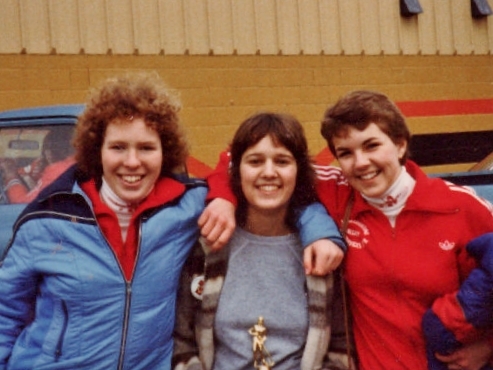 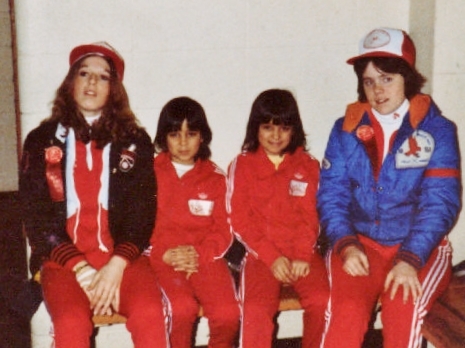 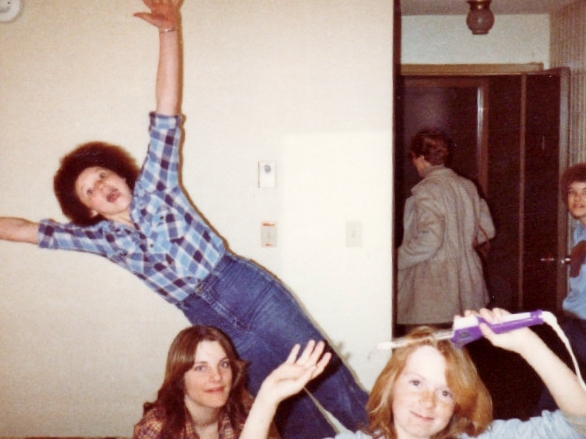 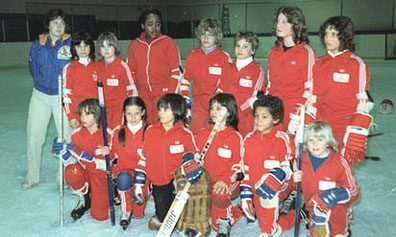 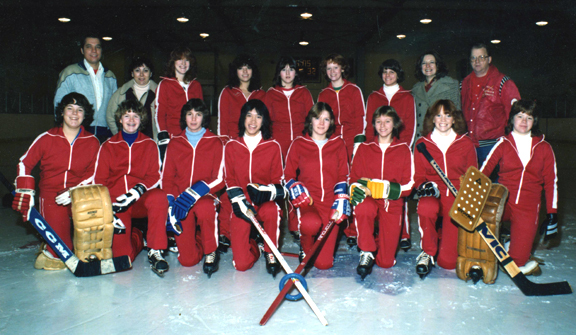 The third annual Booster Club Ringette School was held in August of 1981 at Norma Bush Arena. 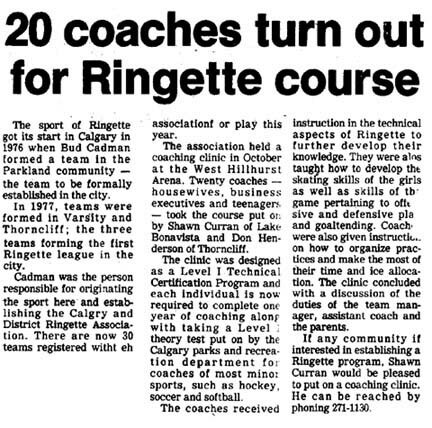 It was organized by Frances Willis and instructors included: Lori Cavers, Claire Lukey, Gerry Zuk, Leanne Henderson, Sandy Thompson and Laurie Turta. 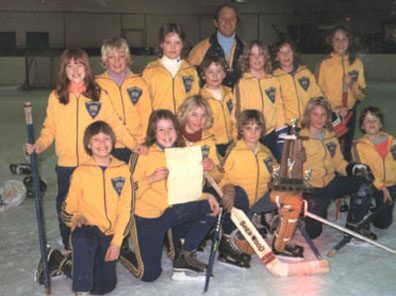 Wally Kozak taught power skating. 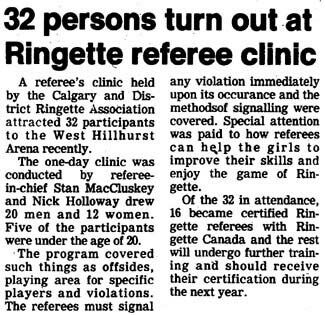 Referee and coaching clinics were held at West Hillhurst in October. 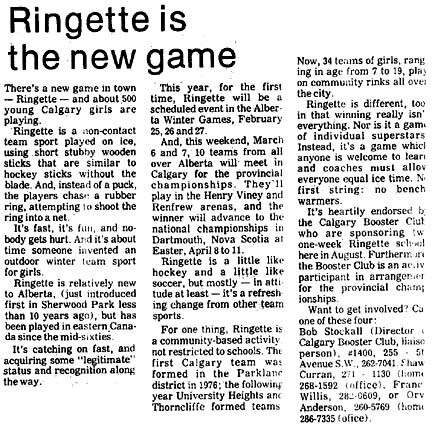 for the Calgary Ringette Association by Laura Webb. 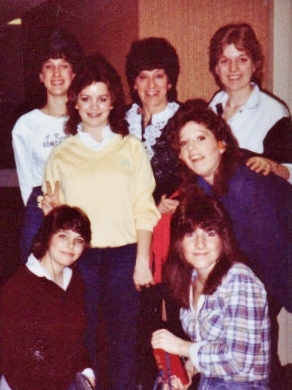 Front Row (L to R) - Linda Tippin, Sue Croswell, Dana Dane, Yvonne Fischer, Debbie Cramm, Lucie Anne Ingoldsby, Diana Dane. 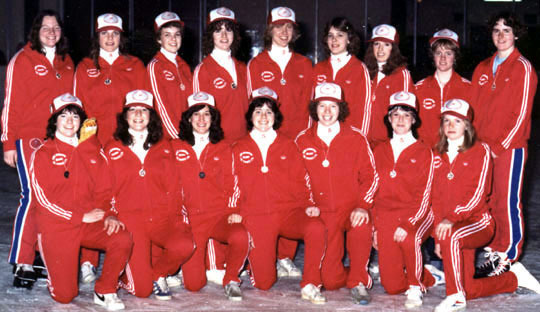 Calgary’s first Deb Rep team made a great showing in all aspects throughout the season. 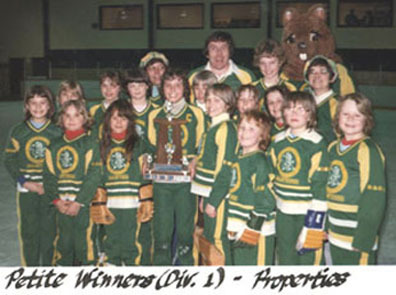 They travelled to Winnipeg in February and although they were defeated they made a respectable showing in all games. 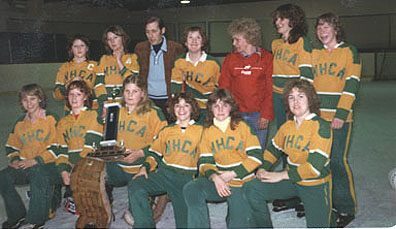 They lost to the 1982 National Champions (Kilcona) by a margin of three goals. 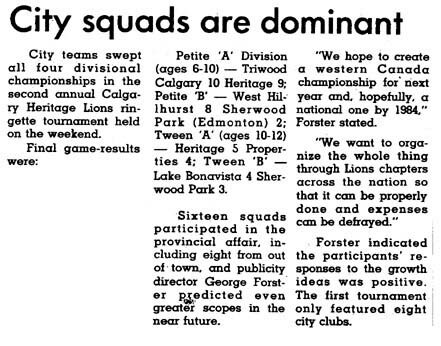 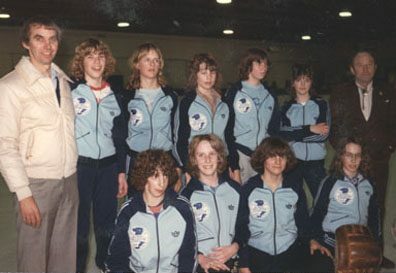 The next tournament they attended was the Provincials in Calgary. 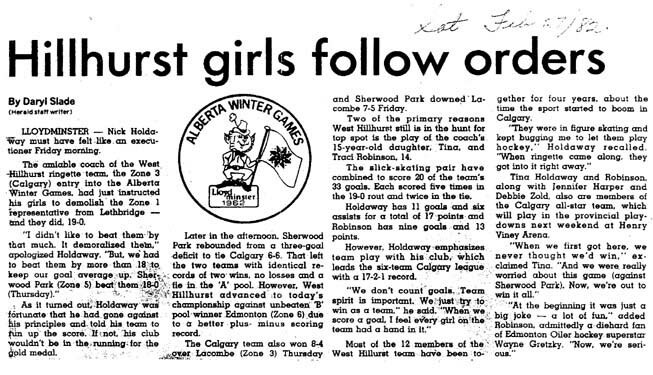 They played a best of three series against Sherwood Park and faired well. 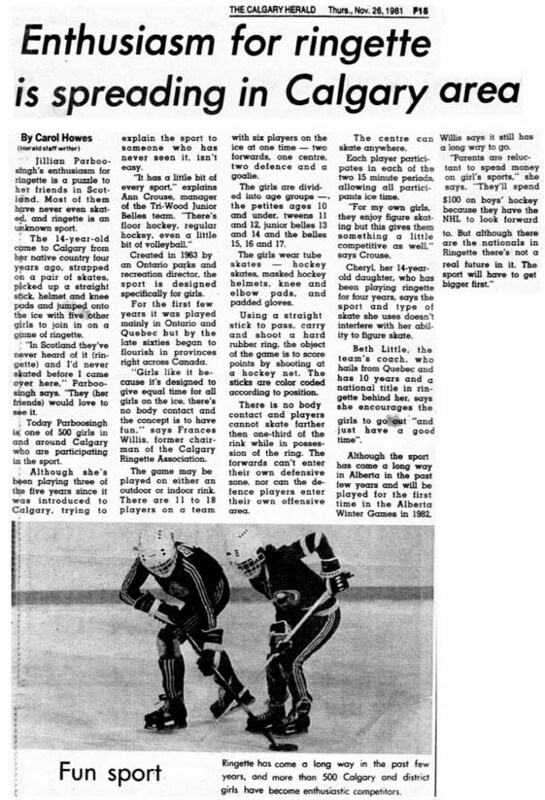 The first game ended in a 7-7 tie, followed by a 6-5 loss. 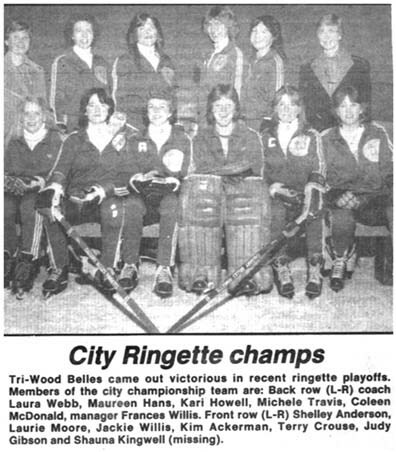 The third and final game ended in an 8-8 tie, therefore the series being awarded to Sherwood Park. 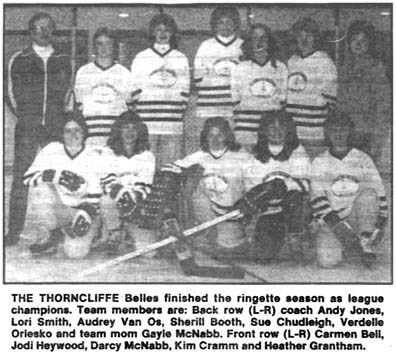 The Belle Rep team completed a very successful season, commencing with a four day trip to Aldergrove in January. 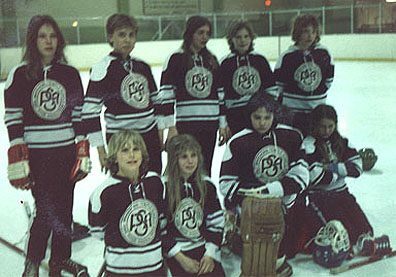 Here they participated in a Deb level tournament. 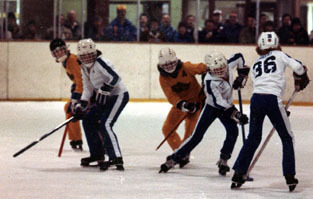 Opposition included Sherwood Park, B.C. 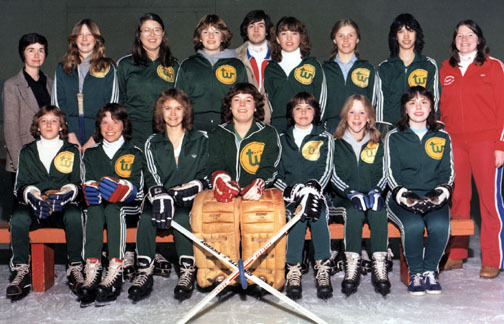 Selects, and Winnipeg. 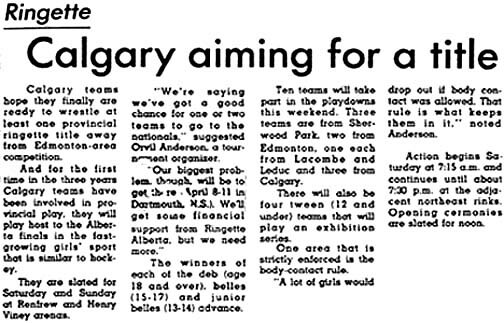 The Calgary team faired very well with all games being close. 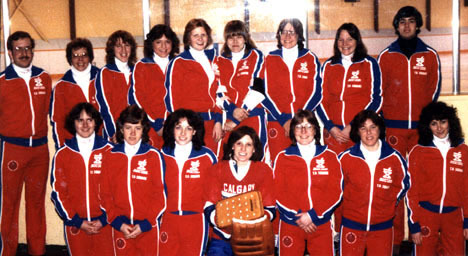 At the next event, the Provincials, they produced the finest performance of any Calgary team in the past. 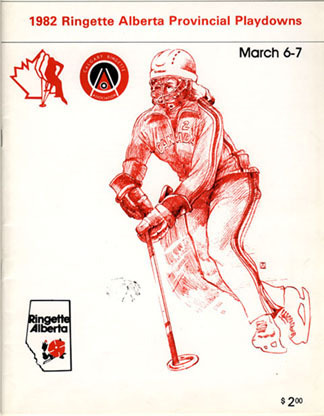 After gaining a birth in the finals, Calgary put on a superb show and suffered a disappointing 9-6 loss to Sherwood Park. 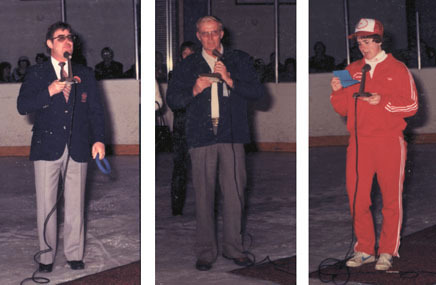 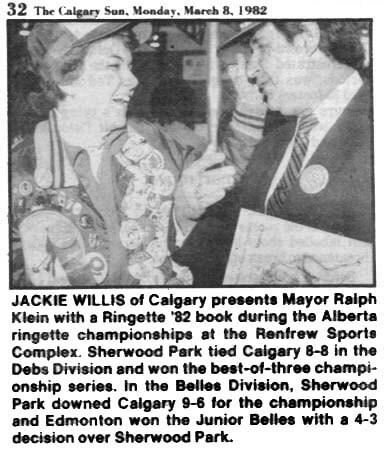 Calgary Mayor Ralph Klein (left) opened the ceremonies for the Provincial Playdowns, the late Orvil Anderson (centre) welcomed the teams on behalf of the tournament committee, and Linda Tippin (right) offered the athletes prayer.